Ukrainian national project "Ukrainian People's Award" published a list of winners of 2018 year. 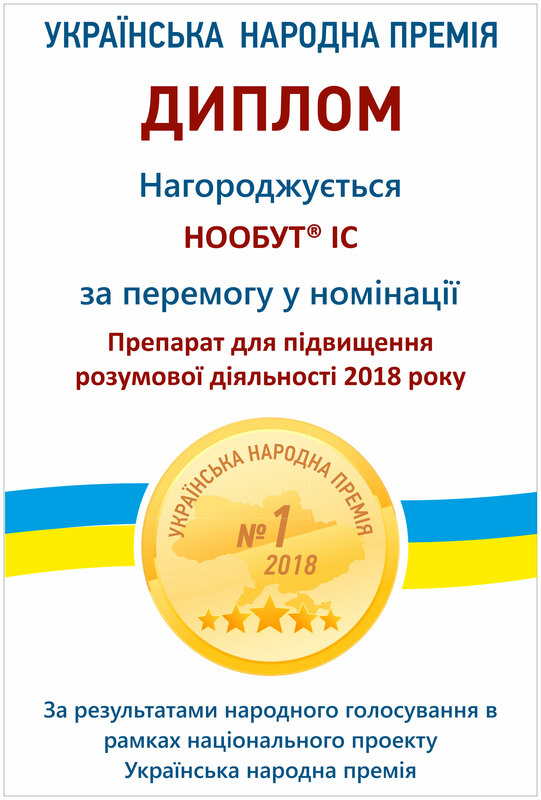 According to the results of the popular vote, the drug "Noobut ​​ІC" won first place in the category "The drug for increasing mental activity in 2018". “Ukrainian People’s Award” is an Ukrainian project aimed at determining the best goods and services among those represented on the Ukrainian market, based on the preferences of the most fair and strict jury - Ukrainian consumers. Nootropic drug "Noobut ​​ІC" is recognized as the undisputed leader in the group that received popular recognition. The drug "Noobut ​​ІC" stimulates learning processes, improves memory, increases physical and mental performance, eliminates psycho-emotional stress, anxiety, fear, irritability, improves sleep. The drug is available in different dosages and dosage forms, which allows its use in both adults and children. Detailed information about the drug, read the instructions for medical use.